Currently, the U.S. Bankruptcy Code provides that student loans can only be discharged in bankruptcy if excepting the debt from discharge would impose an “undue hardship” on the borrower and the borrower’s dependents. But the Code doesn’t offer a definition or test for determining undue hardship. It’s left to bankruptcy courts to decide undue hardship for student loan borrowers. That may soon change. Earlier this year, the U.S. Department of Education issued a request for public comment on evaluating undue hardship claims, expressing concern that borrowers may be “inadvertently discouraged from filing an adversary proceeding in their bankruptcy case.” So, what’s an adversary proceeding, and how likely is it that you can get your student loan debt discharged in bankruptcy? 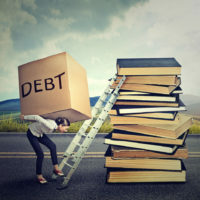 Read more to learn about proving undue hardship and how it relates to discharging student loans in time of bankruptcy. When you file for bankruptcy, the burden of proof is on you to show repaying your student loan debt would cause you undue hardship. To make your case, you must initiate an adversary proceeding against the holders of your debt. During this proceeding, the guarantors and/or educational institutions holding your debt may object, or defend against, your claim of undue hardship, or—if you’re successful—concede an undue hardship. How likely is it that a bankruptcy court will discharge my student loan debt? Because Congress has never defined the term “undue hardship,” federal courts have established the legal standard for a student loan borrower to prove undue hardship. Generally, courts have used one of two tests to analyze whether undue hardship is proven: the Brunner test or the Totality of the Circumstances test. Under the Brunner test, you must show that (1) based on your current income and expenses, you cannot maintain a minimal standard of living for yourself and any dependents if forced to repay your loans; (2) additional circumstances exist indicating that this state of affairs is likely to persist for a significant portion of the repayment period of the student loans; and (3) you have made good faith efforts to repay your loans. Under the Totality of the Circumstances test, the court examines (1) your past, present, and likely future financial resources; (2) your reasonably necessary living expenses; and (3) any other relevant facts and circumstances. As you can see, these tests are potentially subjective. Unfortunately, what this means for student loan borrowers is it’s hard to predict how likely it is your student loans will be discharged in bankruptcy. However, many bankruptcy judges are much more open to discharge all or some student loan debt than they were in the past (as reported by the Wall Street Journal), which, along with the Department of Education’s request, posits potential relief for thousands of people struggling with high student loan debt. If you’re considering bankruptcy and you have student loan debt, call the Ventura bankruptcy attorneys at Rounds & Sutter. We’ll see if you may qualify for a student loan debt discharge and lead you through the process with a strong case for undue hardship. Our Ventura bankruptcy lawyers represent clients throughout Southern California from offices in Ventura, Santa Barbara, and Westlake Village.